I'm currently building a CMS using Drupal 8 hosted in Acquia Cloud. At this time of the process, the goal was to do the setup of URL Patterns. In order to do this, I need to install the module Pathauto and its requirements (Token and CTools) [as it's shown here]. After some going around, found out the installation of modules isn't actually as straightforward as clicking a button, inferred from seeing the following screen (doesn't appear that functionality). After some research, found that there's a page in Acquia documentation with an explanation of how to install a Drupal module on Acquia Cloud. 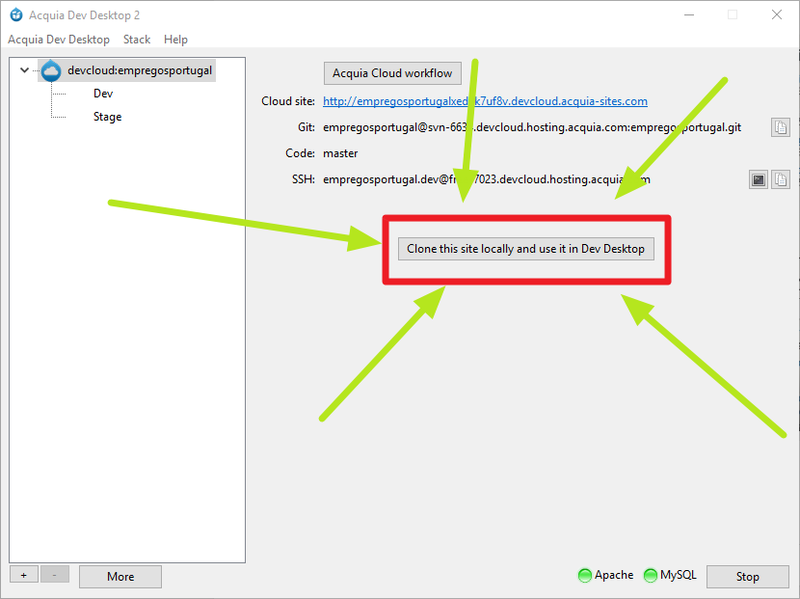 The approache I started doing was to develop the application locally using Acquia Dev Desktop, add new modules using local tools like Drush or the Update Manager, and then push the code to Acquia Cloud with Acquia Dev Desktop. 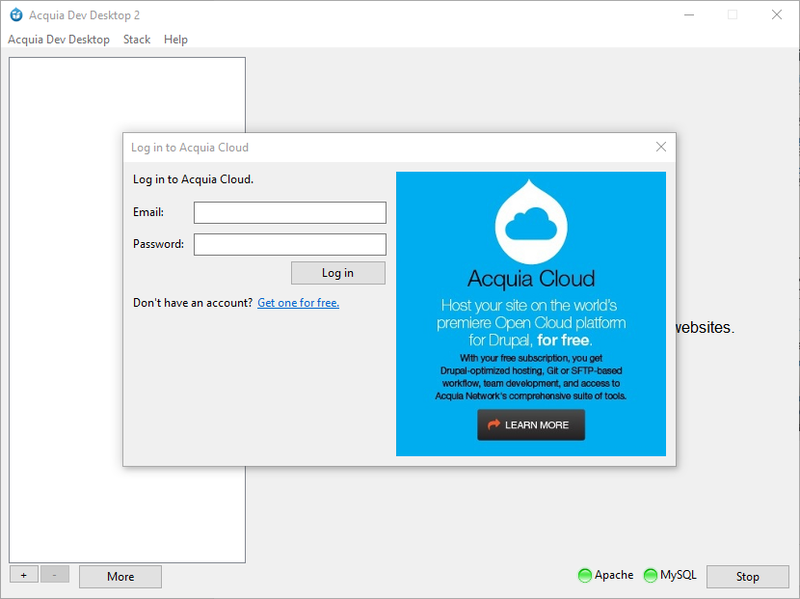 After installing Acquia Dev Desktop, I need to do the login using the Acquia Cloud credentials. While on it, there's a button meant to allow to clone this site locally, which is what I want to do now. 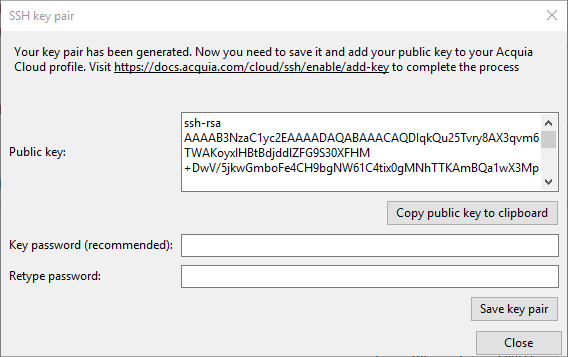 /app/profile/ssh-keys on my Acquia Cloud account. After this, I'm in need of a Private key file to continue the process and i'm blocked. Given this information bellow, what can I do to have it? The solution was to forget about Acquia and start using cPanel. In here, was as straightforward as creating a subdomain, taking advantage of Softaculous scripts by installing in that location the 8.4.3 version of Drupal. Once installation was complete (which was a matter of seconds) and I've logged in as admin, installing a module was never easier! Click "SSH Keys" on the navigation menu on top. On the SSH Keys screen, you can add new keys by clicking "Add SSH Keys" in the upper right corner. 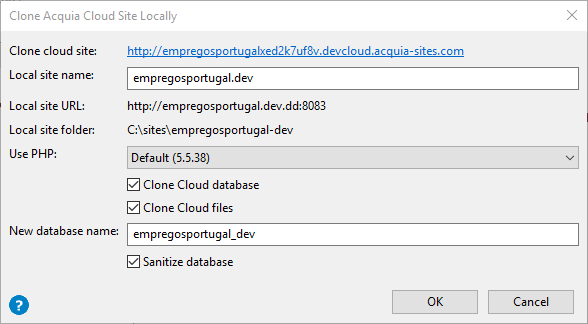 Add the public key that you want on your account (info from key generated by Acquia Dev Desktop). 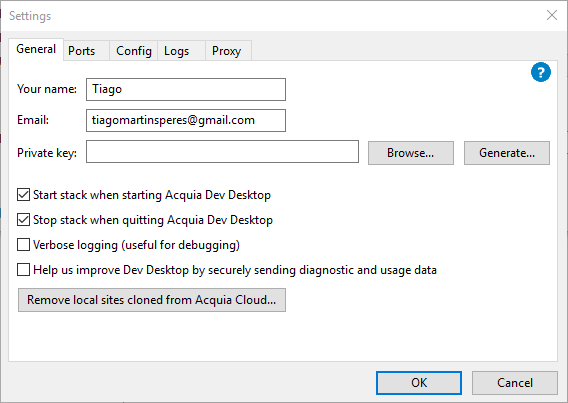 After adding your public key to your Acquia account, you should be able to use the key from Acquia Dev Desktop. Not the answer you're looking for? Browse other questions tagged 8 acquia-dev-desktop acquia-cloud ssh or ask your own question.